You are here: Home / News & Events / LEGO Club -- Build your Imagaination! 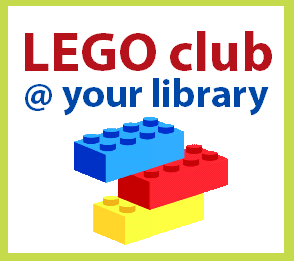 For kids ages 7 and up, LEGO Club meets weekly @ YOUR LIBRARY! Everything is AWESOME at our LEGO Club! The LEGO club is held after school on WEDNESDAYS from 3:15-4:30 in our children's library for children ages 7 and up. A snack is served. In addition, LEGO Club will be held after each early dismissal from school, starting 15 minutes after the dismissal time. LEGO bricks will be provided by the Library. What will YOU build @ LEGO CLUB? ?